Neutrinos are extremely light, very weakly interacting particles produced in weak processes like beta decay or fusion. In fact, most neutrinos passing Earth originate in our sun. Their cross-sections are so low that one needs to build huge detectors like Super-Kamiokande in Japan, holding 50,000 tons of water, to observe them, in spite of the fact that trillions of them pass through our body every second. We work both on their fundamental properties as well as their impact on supernova dynamics. While a lot of progress has been made in neutrino physics, some of their fundamental properties are still unknown, including their masses, the mass hierarchy, and the question of whether neutrinos are Majorana or Dirac particles (i.e., whether they are their own anti-particles). 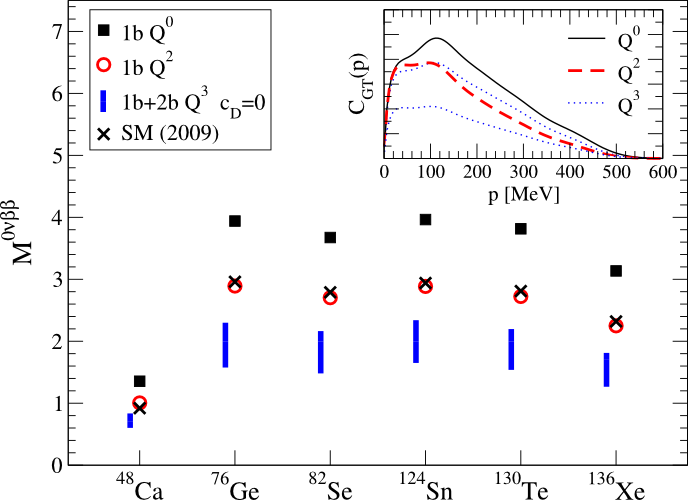 One of the most promising experiments aiming at answering these questions is neutrinoless double-beta decay (0νββ): Basically, for some isotopes beta-decay is energetically forbidden, which allows to detect the double-beta decay (i.e., converting two neutrons into protons simultaneously). In this rare process, usually two neutrinos are produced, but if neutrinos are Majorana particles, they could annihilate, leading to a neutrinoless double-beta decay. Several experiments worldwide are currently searching for these decays, but no detection has been achieved so far. Assuming that neutrinos are Majorana particles, upper limits on neutrino masses can be obtained from the lower limits on the 0νββ lifetime. This extraction is based on theoretical nuclear matrix elements (NMEs), which evaluate the 0νββ transition operator between the initial and final nuclei and hence depend on their structure. Since 0νββ candidates relevant for experimental detection have masses that range from A=48 to A=150, the nuclear shell model is an ideal choice to perform the many-body calculations. A proper description of the 0νββ transition operator is also needed. Most calculations performed so far are based on one-body currents (operators), but we have also recently introduced corrections in the form of two-body (2b) currents which account for the nucleon-nucleon interactions within nuclei. These 2b currents are predicted in chiral effective field theory and are consistent with nuclear interactions obtained in the same framework. Our first calculations suggest an important impact of 2b currents on NMEs of about 20%. Aside from being of interest from a particle-physics point of view, neutrinos also play an important role in astrophysics, probably powering the dynamics of supernova explosions and setting the conditions for the nucleosynthesis of heavy elements. Hence, we would like to improve our models of how they interact with supernova matter, i.e., matter which is neutron-rich, hot, and dense (1011 - 1014 g/cm3). 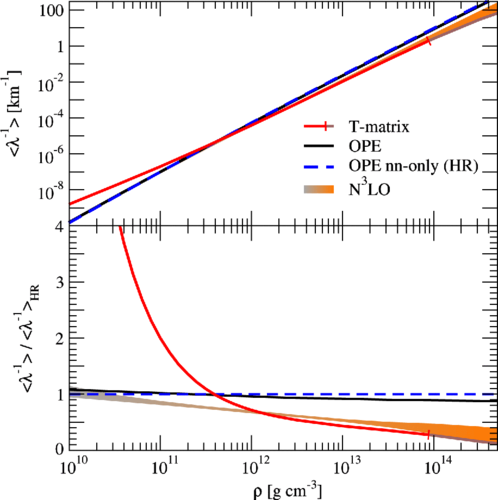 Interactions of interest from a nuclear physics perspective include bremsstrahlung and neutrino pair emission (NNνν↔NN), inelastic scattering on nucleon pairs (NNν↔NNν), as well as the corresponding charged-current processes (e.g., nnν↔npe) and (anti-)neutrino capture on a single neutron (proton). Some of these processes are not included in current supernova simulations, while the cross-sections for others are based on out-dated nucleon-nucleon potentials. The goal of our project is to provide better input for these simulations and work closely with people in the supernova community to evaluate the impact of our findings on supernova dynamics.